In the darkening days of autumn, in a remote region near the Canadian border, a journalist has been murdered. Anne Marie Johnson was last seen with Reeve Landon, whose chocolate Labrador was part of an article she had been writing about a scientific canine research program. Now Landon is the prime suspect. Intensely private and paranoid, in a panic that he'll be wrongfully arrested, he ventures deep into in the woods. Even as he evades the detective, Landon secretly feels the whole thing is somehow deserved, a karmic punishment for a horrifying crime he committed as a young boy. While Montana FBI investigator Ali Paige is not officially assigned to the case, Landon—an ex-boyfriend and the father of her child—needs help. Ali has only one objective for snooping around the edges of an investigation she’s not authorized to pursue: to save her daughter the shame of having a father in jail and the pain of abandonment she endured as a child. As the clock ticks and the noose tightens around Landon's neck, Ali isn’t sure how far she will go to find out the truth. And what if the truth is not something she wants to know? Two stoic individuals who share traumatic childhoods and fiercely independent streaks, as well as a daughter from their brief relationship, rally the narrative duties back and forth in Carbo's fourth mystery set against the spectacular backdrop of the Glacier National Parks and rural Montana. Reeve Landon became an unwanted poster boy for changes to gun laws in Florida after a childhood accident with his best friend. He went off the rails as a teenager, before finding some degree of salvation in the Montana wilderness. He spends most of his time with his dog, searching for signs of wildlife, and living in a cabin. It's a quiet, mainly solitary life. The way he likes it. But then a journalist is found dead. Anne Marie Johnson said she came to Glacier to interview Reeve about the canine research programme he and McKay, his chocolate lab, were part of. But she was asking an awful lot of questions about gun laws and gun deaths, tempering Reeve's attraction. Tabbed by authorities as the last to see Anne Marie, Reeve quickly becomes the prime suspect. Which is a huge problem for FBI investigator Ali Paige. Like Reeve she left a troubled past behind on the East Coast, and enjoys the space and solitude offered in Montana. She's a mother to Emily, but keeps her private life private. Can she keep doing that when her daughter's father is a murder suspect? Carbo delivers a fascinating tale that blends a tight mystery storyline with a great sense of the Montana setting - the place and the people. 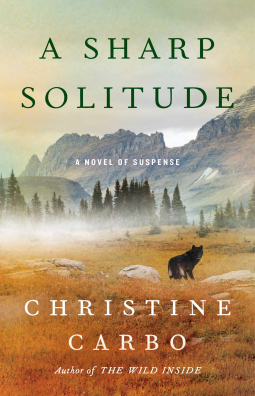 A SHARP SOLITUDE is character-centric crime fiction, seasoned with plenty of interesting psychological and societal issues. Challenges for individuals and the broader community. There's a really nice balance - the story feels 'well-rounded' for want of a better phrase: strong mystery, good characters that are interesting and have depth, great setting. The narrative switches between Reeve and Ali's perspectives, building tension and deepening characterisation along the way. Carbo brings rural Montana to vivid life (I've visited for a few days on my travels, and things rang very true for me, as well as deepening my perspective on the region). There are a few 'what the?' moments along the way, where characters make some poor choices, but rather than feeling like dropped notes or 'author hand' clunkiness to force a story, these end up fitting with their characters and the world Carbo has crafted. There's a messy humanity to it all. An authenticity that deepens our understanding of angst-ridden characters scrabbling through life. This is the kind of book you can just sit back and enjoy as the tale unfolds, but will have you thinking too. And caring. There's some nice texture and depth as well as plenty of intrigue in the storyline. It was a couple of sittings read for me, a book I kept wanting to get back to. And when I closed the back cover, I immediately wanted to read more of Carbo's Glacier Mysteries. So I went and bought books one to three.